Arsenal Object: They’ve nicked our Perry Groves Song!!! Over the years it has been customary when teams from different countries play each other that there is an exchange of gifts before the game kicks off. The gifts generally tend to be pennants or, occasionally, a mounted plaque. Every once in a while Arsenal have been presented with an item that is out of the nom. 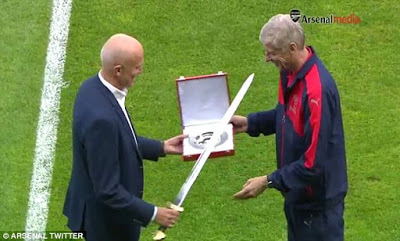 The most obvious recent example of that was the huge Viking sword presented to Arsene Wenger before the recent friendly in Norway. Arsenal proceeded to thump Viking Stavanger 8-0 in the last of their international pre-season games after the manager had held the sword above his head. The Viking Manager came out worse in this exchange! However, in the archives of Arsenal Museum, amongst an almost incalculable quantity of pennants, there is a wonderfully quirky and, in our opinion, the finest present ever received by the Arsenal. 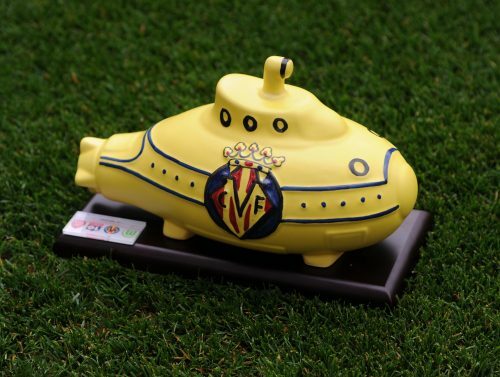 This yellow submarine was given to the club by Villarreal before the Emirates Cup in July 2015, as the Gunners also welcomed Wolfsburg, Olympique Lyonnais for the pre-season tournament in North London. However, the Gunners did not play Villarreal over the weekend, and while both had victories over the same opponents, Arsenal won the trophy on goals scored, by virtue of the 6-1 defeat of Olympique Lyonnais on a sunny Saturday. The stylish piece is a reference to Villarreal’s nickname – the Yellow Submariners – which is apt as they are a small team in Spain who occasionally move up to the surface and challenge the bigger fish such as Barcelona and the two Madrid teams. But the nickname emanates from 1966-67 when they were attempting to gain promotion into the third division. In one match a group of supporters behind one of the goals started playing the Beatles’ song on a record player and, looking out at their team’s yellow shirts, started chanting to the tune of the song. 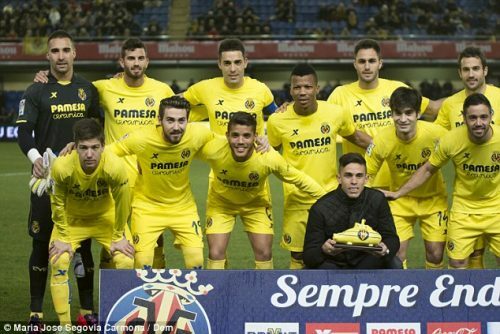 Villarreal now play in all yellow, which was first worn in 2003, whereas previously from 1947 they lined up as an Arsenal away team would in many seasons: yellow shirts and blue shorts. The Emirates Cup invitation was a culmination of a previously non-existent relationship which had blossomed after both teams reached the Champions League semi-final of the 2005-06 season. Drawn against each other, the first leg was a cagey affair at Highbury – indeed it was the last European game Arsenal played at the great old stadium – with a goal in the 41st minute from Kolo Toure giving the Gunners a slim, but deserved, lead to defend going to Spain. 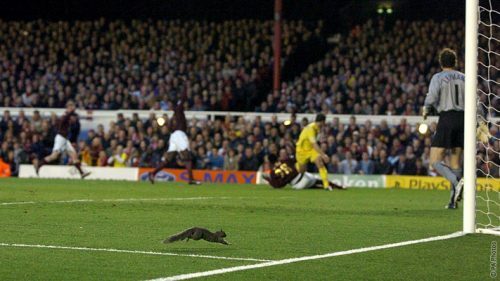 However, the real star of the show at Highbury was the squirrel who put in a cameo appearance on the pitch and received a chant from the crowd of “Squirrel, Squirrel, Squirrel” for its efforts. The squirrel, who up to that point had made more CL appearances than Spurs! At the time Villarreal was, and still is, the smallest town to host a Champions League semi-final. El Madrigal was full of yellow in the stands, alongside travelling Gooners contributing to a rousing atmosphere as 23,000 crammed into their small ground for the return leg. Arsenal managed to hold on for a 0-0 draw and thus qualify for their first ever Champions League final. But the story of the game was more nerve racking than just a goalless match in which the Spaniards held sway for the first half. Shortly after the second half began a fan ran onto the pitch and attempted to place a Barcelona shirt on Thierry Henry before the supporter was bundled away. But this was just a minor distraction to Jens Lehmann’s man of the match performance in which he almost singlehandedly got the team into the final. Most notable of Lehmann’s saves was when he stopped a last minute penalty from Villarreal’s talismanic Argentinian forward Juan Román Riquelme. With the minutes ticking away it looked as though Arsenal had booked their place in the final. However, Gael Clichy was harshly judged to have fouled Jose Mari and the referee awarded the home team a penalty, but Lehmann dived to his left to save Riquelme’s spot-kick. At the final whistle Lehmann was mobbed by his team mates who appreciated his heroics throughout the game. After the final, Robert Pires and Pascal Cygan both joined Villareal. Pires appeared for them as we met again in the Champions League in 2009 when the Gunners were again successful winning the quarter final tie 4-1 on aggregate. More player exchanges followed in January 2015 as Joel Campbell went to the El Madrigal on loan, while Arsenal purchased Gabriel from the submariners. 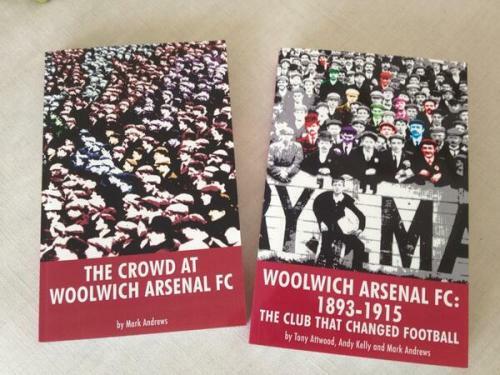 This season we’ve been asked to write a regular page in the official Arsenal magazine based on a historical object related to the Club. Magazine and Programme editor Andy Exley has kindly given us permission to reproduce the match reports on our blog. We will also be including additional material that didn’t make the final edit of the magzine. Bit of a panic at half time ther ‘cos the lights went out and people started worrying the game would be postponed (flights etc). A few of us were staying at my flat just down the coast so we were OK but it was worrying. The square after the game was wonderful (we stayed until around 2am) with a mix of fans and nothing even approaching trouble (apart from two Spanish guys arguing over a woman!). They were doing a live outside broadcast from there and I ended up getting interviewed for local TV…can’t have been that good as they never asked me back. Next night we were back in Javea and watched Barca beat Chels in the local Barca fan bar. The owner thought we were going to be supporting Chels when we walked in as we were English so we pointed out we were supporting Chels as much as he had supported Real the previous night. We got a few rounds for free off him! Nice piece of recent history there.